I ended last month swimming in the Med, reading in beautiful gardens, eating Neapolitan pizza and drinking Ischian wine. 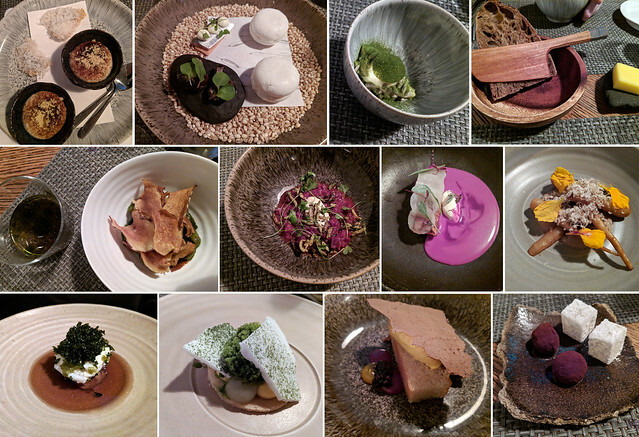 I ended this month eating delicious Michelin-starred food right here in Bristol (if you click on the pic above and go to my Flickr page, you can read what all the courses were at the very excellent Bulrush). And the wine might not have been made two miles from where I drank it, but it was pretty damn good. So being back home isn’t so bad (but I still miss holiday). I have started three or four books since coming back from holiday, but finished none of them. Maybe I need to set aside a day for nothing but reading sometime soon – a good old-fashioned read-a-thon. That would be nice. Lack of reading aside, this month I watched a couple more K-dramas – Love in the Moonlight and Strong Woman Do Bong Soon – and I also went to the cinema for the first time in ages, to watch the excellent biopic First Man. Here’s to a happy November. I am very torn in my reactions to this K-drama. On the one hand, I love the lead character and the setting felt more like a realistic modern Seoul than any of the other dramas I’ve seen set there, except maybe Doctors (Strong Woman Do Bong Soon first aired in Korea in 2017 so it is the newest K-drama I have watched). On the other hand, the sense of humour can be not only juvenile, but also homophobic. And it started so well! This show juggles a few different genres and to begin with I loved the switches from one to another, but they were less well balanced in the second half. Similarly, the storylines all started strongly, but got a bit lost around the halfway point. It’s almost as though different writers took it over. It’s certainly the first time with one of these K-dramas where it hasn’t felt carefully plotted from start to finish. Genre one is superhero, and the superhero in question is Do Bong-soon (played by Park Bo-young). She is a petite 27-year-old who didn’t do well enough at school to go to university, has never held one job for long, but dreams of designing computer games. Oh, and she has supernatural strength, which she uses to save people from danger. She’s cute and girly but also a little bolshy, which probably comes from her experience of standing up to bullies. I picked this off my Classics Club list (which I’m woefully behind on). The premise – revealing what’s behind the twitching lace curtains of small-town America in the 1930s and 1940s – definitely intrigued me, but I didn’t realise quite how much would be revealed. This is the book equivalent of an ensemble drama – there isn’t really one lead character. Metalious beautifully establishes the setting, describing autumnal New England in its colourful glory before beginning to introduce the town’s inhabitants. There are the rich elite of Elm Street, the gossiping poker-playing old men, the class-boundary-defiant teenagers, the middle-class mothers fearful that their secrets will be discovered. “Clayton Frazier set his coffee cup down with a little click, and then he looked hard at the stranger for a moment. This is a fascinating Japanese novella about an unusual person trying to understand the world. It’s funny and empathetic and the Tokyo setting really brought back moments from our Japan holiday. Lead character and narrator Keiko is a convenience-store worker. She has worked there since her first year at university and is still there 18 years later because it’s the one place where she feels she belongs. But as the years pass she feels increasing social pressure to conform. And her attempts to conform are at once hilarious, heartbreaking and unsettling. Keiko is not just socially awkward. We are never given a formal label but she struggles to empathise with any human emotions or actions. She is alienated by her inability to truly feel and experience what others do, but she has learned to fake it by copying others. She copies how others dress, speak and react, choosing new people to copy every so often who seem appropriate for her (in terms of age and station in life). This can lead to unintentionally comically or extreme moments. One of the major genres of Korean TV is historical epic, so I thought I should try one out. I sampled a few before settling on 2016’s Love in the Moonlight (also known as Moonlight Drawn by Clouds). I think I was drawn to the romance element (as well as the Shakespearean cross-dressing comedy) so I perhaps shouldn’t have been surprised that this shared a lot in common with Boys Over Flowers. And I do mean a lot.